The first catholic church built at Hudson, New Hampshire, St. Kathryn's location at Lowell and Wason roads was dedicated in 1968 and served its pastor and parishioners well for many years. 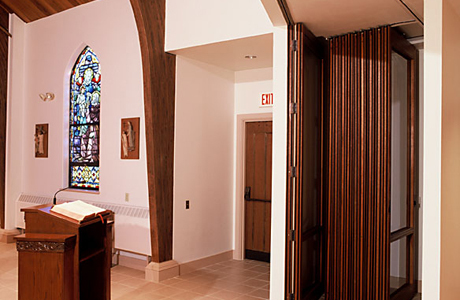 In the mid-1990's the parish began a capital campaign for a new church: the new facility would needed flexibility to accommodate services of significantly varying sizes, a programmatic feature that would be facilitated, ultimately, by the inclusion of a NanaWall wood-framed installation. 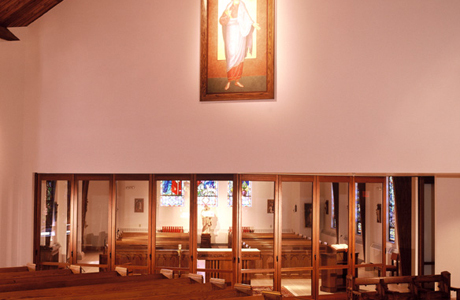 "The parish wanted to be able to separate a smaller chapel from the main body of the church for smaller weekday services," notes William Buckingham, founding principal with Sullivan Buckingham Architects who designed the new St. Kathryn Church for Boston's Keefe Associates. "This was intended to reduce operating costs, by creating a smaller space to be heated and cooled when needed, without controlling the climate of the entire church." 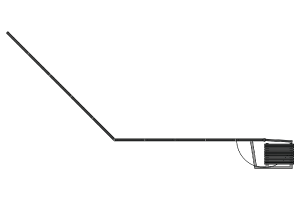 "The NanaWall system provides the needed insulative barrier, while the glass reinforces the connection between the smaller and larger spaces." NanaWall's HSW65 Wood Framed Single Track Sliding System suited this use well. 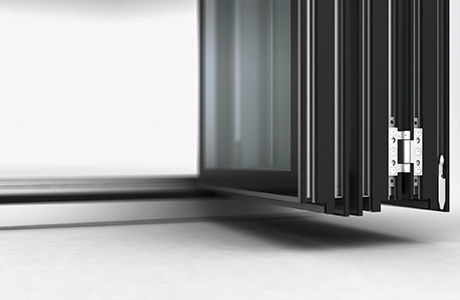 Designed for use in exterior applications, the system boasts high thermal performance. When closed, the small chapel is thermally separated from the main church interior, creating the desired small chapel. The result is that operating costs associated with power for heating and cooling are much lower than they would be otherwise. 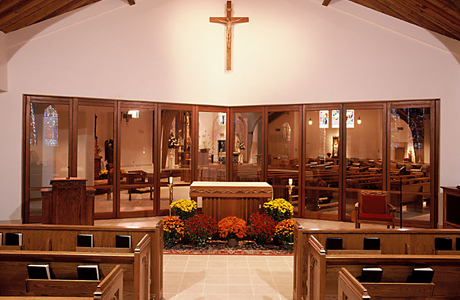 When fully open, the chapel appears not to be separate at all from the main church space, and provides additional seating for the large turnout at Christmas, Easter and other major holiday services. 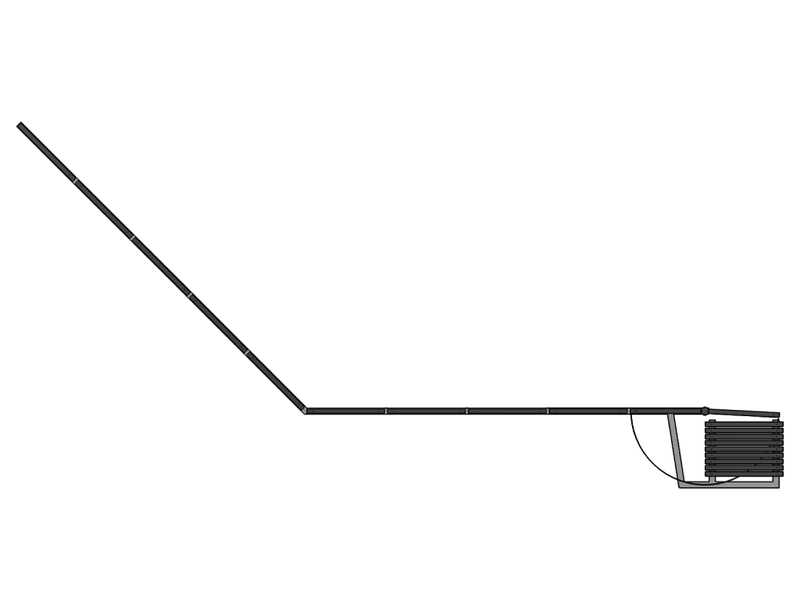 "The panels stow away very neatly at one end," admires Buckingham, referring to the pocket arrangement used to hide the panels from view when open. "We've since used another NanaWall system in a similar project," Buckingham explains. 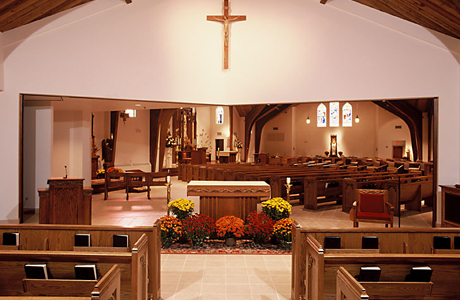 "The client had seen St. Kathryn's and fell in love with the design." NanaWall's wood-framed system was also able to achieve further hopes of the Parish and Diocese for the new church, beyond those of cost-reduction. These included aesthetic goals, in addition to the programmatic. "Besides thermal separation," notes Buckingham, "the client wanted the small space to enjoy daylight, and views of the stained glass. That required transparency. The NanaWall system provides the needed insulative barrier, while the glass reinforces the connection between the smaller and larger spaces." Some competing systems offered thermal performance like NanaWall’s, and its transparency, but few could match the system's sturdy construction, its ease of operation nor its pocketed stacking option, which renders the panels all but invisible when stowed. The system affords the little church a great deal of flexibility at a reasonable price, representing a sizeable return on investment. Furthermore, the high-performing wood framing looks entirely at-home in this cozy New England church. "NanaWall had enough available wood species to choose from that matching the church's interior aesthetic was not a problem," says Buckingham. The combination of flexibility, performance and beauty has served the Parish well since the new church was dedicated in 2000, and has even become a coveted architectural feature among representatives from visiting parishes. As Buckingham mentioned, the firm has used NanaWall for a similar project, where the client had visited St. Kathryns.